It’s with great sadness that we share the news that Bob Brookmeyer passed away last night, just three days shy of his 82nd birthday. Bob was an integral force in music, making some of the greatest groups in jazz history what we know and admire today. Whether as a composer, arranger or trombonist, his voice is immediately discernible from the very first note, always bringing a smile and one word: "Brookmeyer." For many of us, Bob has always been a tremendous inspiration and an overflowing wealth of knowledge. You'd be hard to find a large ensemble composer that doesn't have Bob's name on the top of their list of favorites. For those lucky enough to have the opportunity to study with him, we were given more than just an education in the art of being a great composer, we were given a level of both love and support that expanded far beyond the classroom. He had a wonderful ability to cultivate our inner strengths, yet pull us out of our comfort zones and stretch us farther than we could have ever imagined possible. Bob's newest album, STANDARDS, which was officially released a few weeks ago, was a record Bob was incredibly proud of. 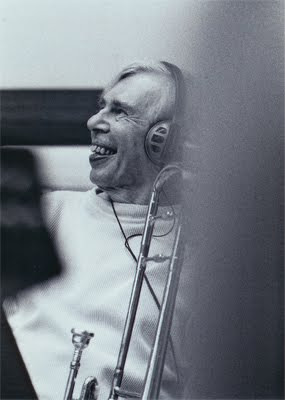 It is a true masterpiece in every sense of the word, with each arrangement encompassing everything that is "Bob Brookmeyer." 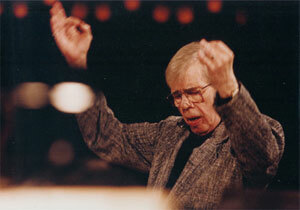 Bob, you were an amazing force and a fearless leader to all jazz composers. Thank you for your years of inspiration, support, and for leaving a legacy of music to continually inspire us for years to come. Bob Brookmeyer had an unusually varied and extensive background in all forms of improvised and composed music. He was born December 19, 1929, attended Kansas City Conservatory of Music where he won the Carl Busch Prize for Choral Composition. He arrived in New York playing piano with Mel Lewis and Tex Benecke, staying there to perform the music of Eddie Sauter with Ray McKinley, free lancing with musicians such as Coleman Hawkins, PeeWee Russell, Ben Webster, Charles Mingus and Teddy Charles. After a brief stay with Claude Thornhill, he joined Stan Getz and maintained that association for 15 years. Leaving Stan Getz in 1954 he joined Gerry Mulligan, replacing Chet Baker, producing the ‘Paris Concerts’ and beginning a partnership that lasted until Mulligan’s death. Among his prime achievements was the creation of the Concert Jazz Band. In 1958, he spent a year with Jimmy Guiffre Three, including Jim Hall, which turned out to be the first group to employ regular free improvisation as a staple of the concert fare. Along the way, he made a cult two-piano album with Bill Evans ("The Ivory Hunters" with MJQ members Percy Heath & Connie Kay), played on George Russell’s ‘New York, New York,’ and became a regular in the studio musicians “A” group. The Quintet with Clark Terry began in 1961 to great success and continues to this day. The Thad Jones-Mel Lewis band once again found him as a key member and contributing composer/arranger. One of Brookmeyer's best-selling albums, the Creed Taylor-produced "Samba Para Dos" (Verve, 1963) paired him with Argentinian genius Lalo Schifrin, featuring Brazilian percussionist José Paulo. Paulo and his then-wife Carmen Costa (yes, the famous Brazilian samba singer who was working a lot as a percussionist in NY at that time) had already recorded with Brookmeyer on another Creed Taylor production for Verve, "Trombone Jazz Samba," cut in August 1962, also featuring Gary McFarland, Jim Hall, Jimmy Raney, George Duvivier and Willie Bobo. Luiz Bonfa's classic "Samba de Orfeu" -- a track from that LP recorded just six months after the historic Stan Getz-Charlie Byrd's "Jazz Samba" -- was included in 2002 on the 2-CD set "Back To Bossa," the third volume in the compilation series "A Trip To Brazil" produced by Arnaldo DeSouteiro for Verve. Btw, he and Jim Hall reunited in 1979, playing as a duo exclusively for one year, garnering critical acclaim. In 1981 he began to work extensively in Europe as a composer and conductor, creating many works for Cologne and Stockholm. He also was appointed Musical Director of the Mel Lewis Orchestra, while beginning a career in University teaching at the Manhattan School of Music. In 1988 he was appointed Director of the BMI Composers Workshop and in 1991 he moved to Holland to start a radical new school for improvised and composed music. Upon the demise of this venture he returned to the United States and settled in New Hampshire, assuming a position as Chair of the Jazz Composition Department at the New England Conservatory. 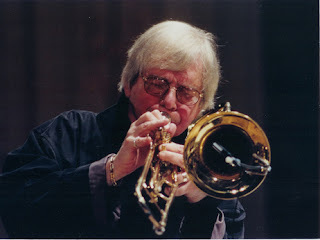 Bob Brookmeyer, a valve trombonist, educator and influential composer/arranger, died last night in New Hampshire, days short of his 82nd birthday. Brookmeyer arrived in New York as a both a trombonist and pianist. He was good enough, in fact, to record a two-piano album with Bill Evans in 1959. But it was his work on the valve trombone with the likes of Gerry Mulligan, Stan Getz and Clark Terry — and his work as a composer, notably for big band — which sustained his career for over five decades. His proteges include acclaimed large ensemble composers Maria Schneider, John Hollenbeck and Darcy James Argue. To wit, Brookmeyer recently released his latest album, Standards, with the New Art Orchestra, the Germany-based large ensemble he has worked with extensively. And below, hear an archived episode of NPR's Jazz Profiles dedicated to Brookmeyer.